The name alone tantalizes the imagination, and brings out everyone’s thirst for exploring the mystic orient. 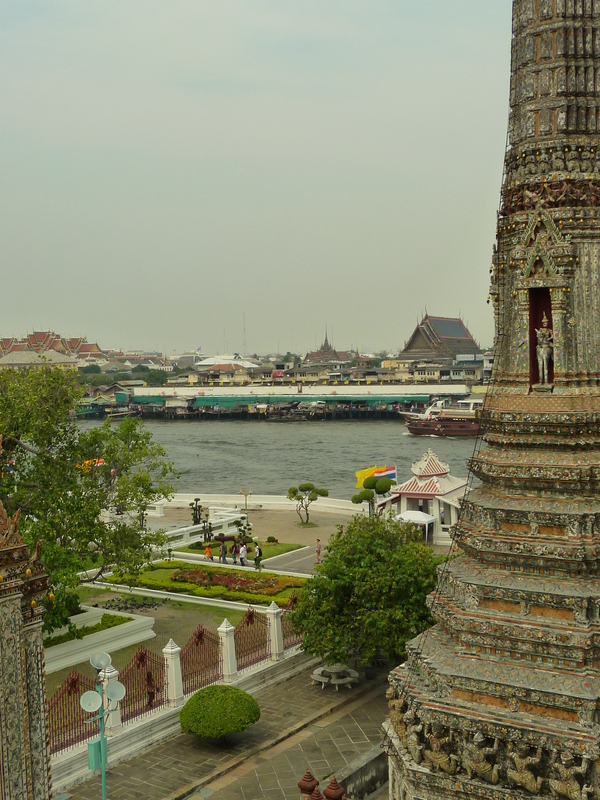 Wat Arun, the Temple of the Dawn, is situated just across the river from Bangkok. It was built in the early 19th Century by the second ruler of the current ruling Dynasty (Rama II). 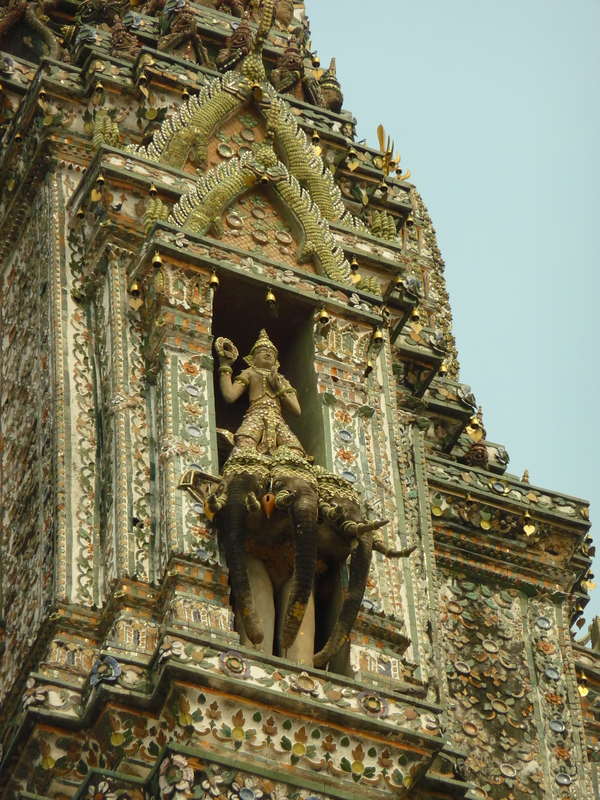 It has therefore been a landmark for a long time and is one of the best known Bangkok tourist attractions. Interestingly though, this famous landmark does not get anywhere near as many tourists as the attractions on the Bangkok side of the Chao Phraya river. This is possibly because the river acts as a barrier, and most tourists perhaps think that they have seen enough merely by taking photos from the Bangkok side. However, I can assure you this is not the case, and the five magnificent towers of Wat Arun deserve to be inspected close-up. 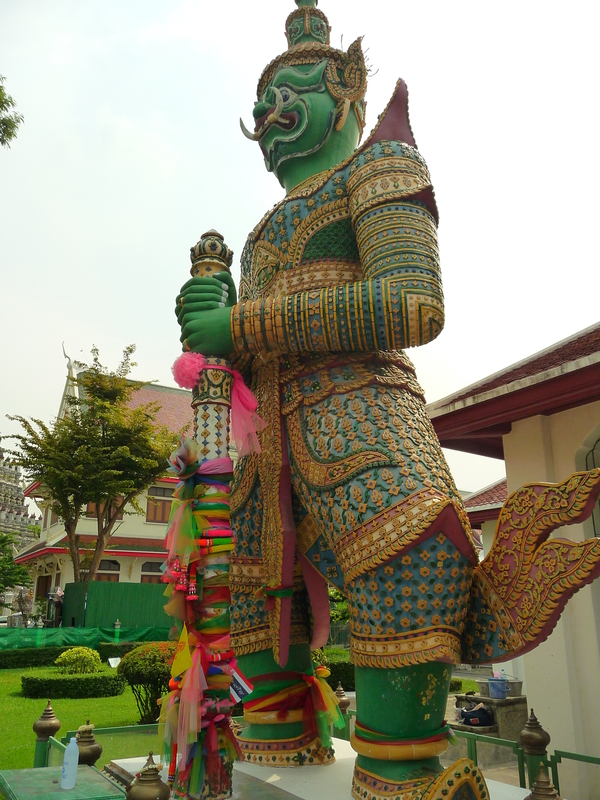 One of the two guards at the entrance… these are the mythical giants (yak) out of the Hindu/Buddhist Ramayana. 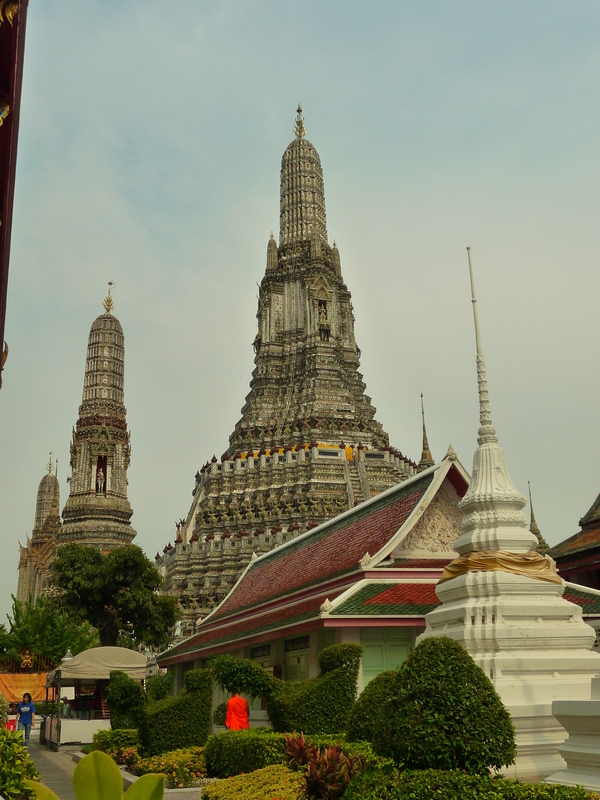 First, a little bit of interesting history about Wat Arun. It is built in the village of Bang Makok on the site of an existing temple dating back to the Ayuthaya period (the former capital prior to Bangkok). After the fall of Ayuthaya, King Taksin established a new capital in Thonburi, beside Bang Makok, and the Emerald Buddha (Thailand’s most revered Buddha statue) was housed in this temple. King Taksin had planned to renovate this temple into something much more magnificent, but he was murdered before this was achieved. After King Taksin’s death, the Chakri dynasty took over and in 1782 the capital was moved across to the eastern bank (Bangkok side) of the river to the newly built Wat Phra Kaew (the move across the river was because the eastern bank was deemed to be more easy to defend against invaders than the western bank). After the move, the original temple in Bang Makok was essentially abandoned until 1802, when King Rama II decided to make good on King Taksin’s plans, and decided to build a magnificent temple on the existing site. The architectural influence of the new temple was Khmer, and its design consisted of a main prang (pagoda like tower) that is 86 metres tall, and four smaller satellite prangs in each corner of the compound. The main Buddha image for the temple was moulded by King Rama II himself and his ashes are interred underneath this statute. Notwithstanding that construction of the temple commenced in 1802, it wasn’t completed until after King Rama II’s death, in 1851. Even though the architecture for the main temple is Khmer in origin, the name of the temple is Hindu and is in reference to the God Aruna, who is associated with the rising sun (particularly the reddish glow at dawn). There is some debate as to the reason for association of the temple with dawn, but a possible reason is that when Taksin was originally sailing down the Chao Phraya river looking for a site for a new capital, he saw the original temple in the glow of dawn’s light and that was where he decided to place the capital. The design is Khmer, and the name is Hindu… and the carvings here appear to be from Hindu origin as well. This elephant carving is very impressive. As I mentioned earlier, you really need to visit the temple up close. The five prangs have intricate sculptures and mozaics (from Chinese porcelain). The four satellite prangs contain some interesting figures propping them up, such as monkey gods and demons. The main prang is guarded by ancient Chinese soldiers. Also keep an eye out for the different animals (the elephant carvings in particular). The spire on the central prang is a seven pronged trident that also has very interesting symbolism (it is the Trident of Shiva). 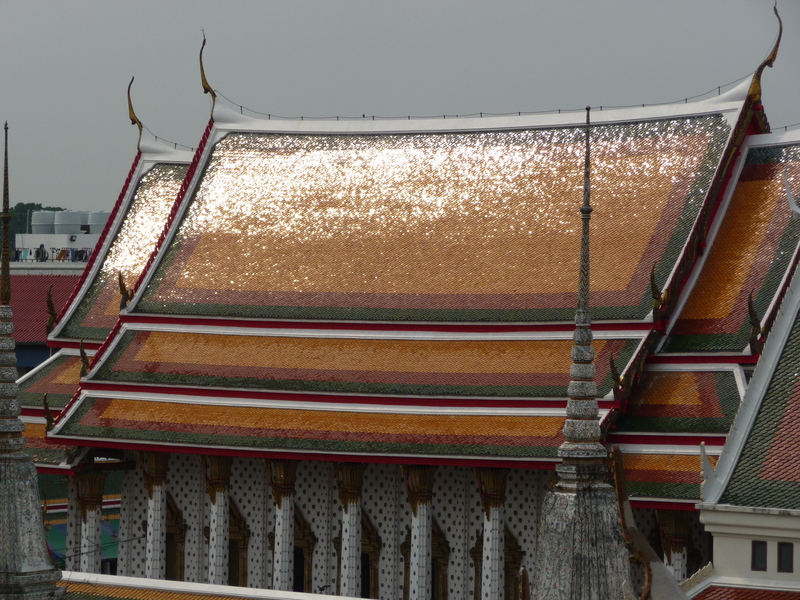 Glittering golden temples on the grounds of Wat Arun… many people don’t realise that Wat Arun consists of much more than just the five prangs, but a large multi-coloured temple complex in the background. The temple itself consists of more than just the five prangs. Instead, behind them are a series of Thai style temples (in similar style to Wat Phra Kaew) that house the local monastery and Buddhist school. Mixed in with a lot of interesting paintings, carvings, gold in-lays are some further interesting Chinese statues, that tell a lot about the early history of the area and its trading partners. The temple complex behind the main prangs is actually one of my favourites because it is well preserved, fairly peaceful, and offers some fantastic photo opportunities. 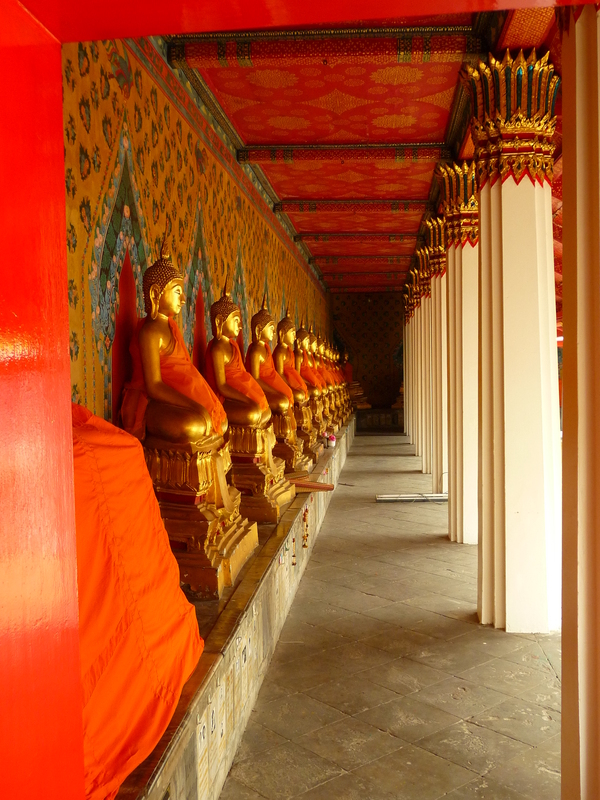 I like the symmetry of this photo… in the main courtyard of the temple complex. To get to the temple from Bangkok, get to Ta Tien (the boat pier just in front of Wat Pha Kaew/Grand Palace), and then take one of the small river crossing ferries. If you are staying in Sukhumvit or anywhere else near the sky train (BTS), the easiest is to take the sky train to Saphan Taksin station, get off and walk towards the river pier, and grab a ferry (orange will be fine) heading north (towards Nonthaburi) and get off at Ta Tien. If you are lazy, then just book a tour with any Bangkok travel agent, although trust me that it just isn’t the same doing it as part of a large tour group. Half the fun of travel in Asia is learning to get around yourself. In terms of costs, the entrance fee is about 50 baht (the last time I went there was a couple of years ago). The river crossing ferry costs 10 baht each way. If you catch the orange ferry from Saphan Taksin to Ta Tien, this costs 14 baht (the tourist ferry costs about double but may be better for those who lack confidence getting around in Asia). 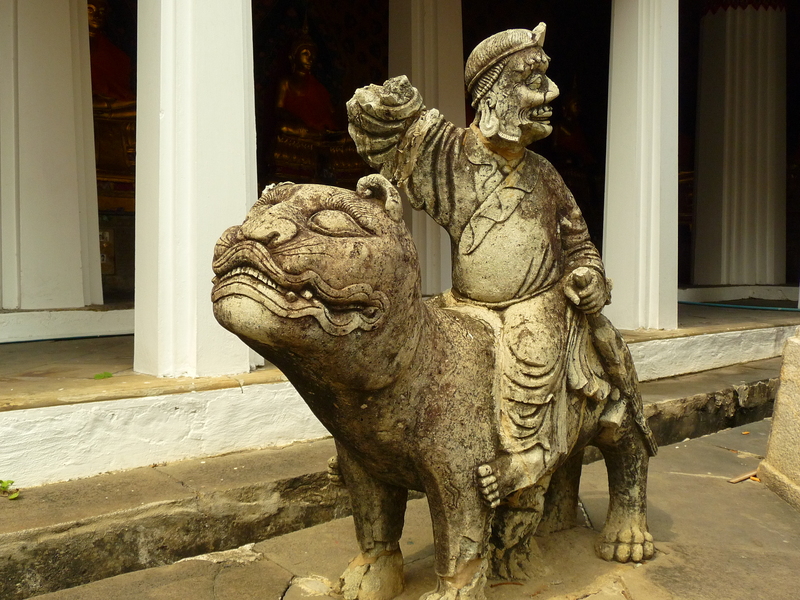 This appears to be a Chinese lion with either a knight or nobleman riding on it… highlights the mix of cultures that existed at the time Wat Arun was built. 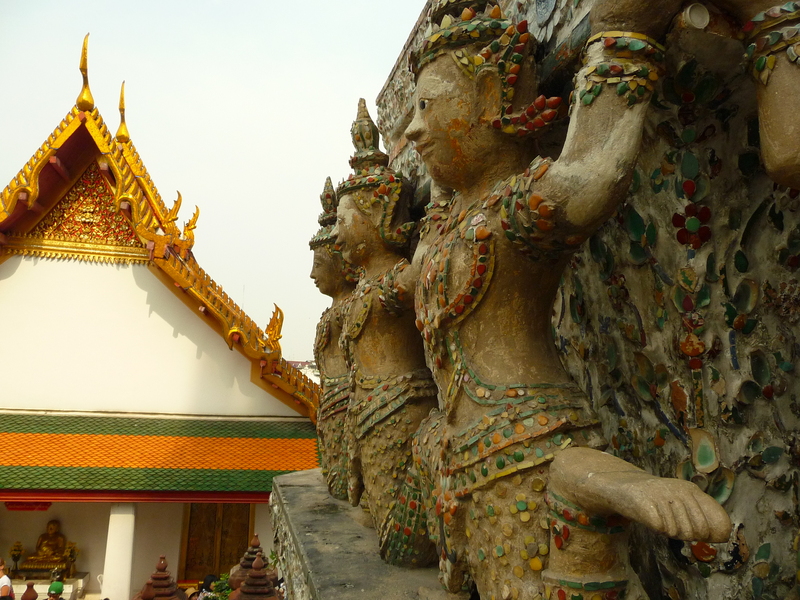 When you first arrive at Wat Arun, you will notice some cut-out figures used for posing for photos. Don’t take your photo here as it is a scam. The owner of the cut-outs will suddenly appear and charge you money for the privilege. Wear suitable clothing as you are visiting a very holy site. Long pants, and for females, nothing too revealing. If you accidentally do turn up in shorts, you can rent a sarong for the day at reasonable pricing. Be very careful on the incredibly steep staircases on the prangs. I strongly recommend wearing good footwear if you do plan on going up, and make good use of the hand holds. A bit of trivia: Did anyone notice that the name of the village (Bang Makok) is very similar to the Western name for the capital of Thailand (Bangkok)? The Thai name for their capital is actually Khrung Thep, not Bangkok, and there is confusion as to just why the official Western name is different. One prevailing theory is that during an early Western visit up the Chao Phraya river, a Western official pointed up river and asked his Thai guide what the name of the place was. He actually was pointing to the area inhabited by the Grand Palace and meant what was the name of the capital, but his guide thought he was pointing to Bang Makok… and the Westerners ever since have stuck with that name. Gorgeous golden roof-tops. The sharp points are to keep evil spirits from entering the building. 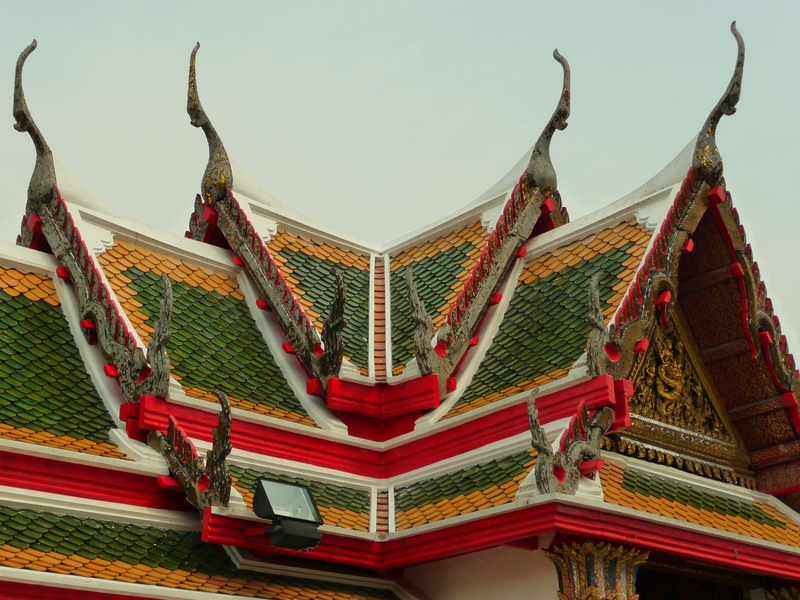 You will notice most traditional Thai architecture incorporates this design.